Gresham Power Electronics the Salisbury based Defence and Commercial power conversion specialist, announces the introduction of a new series of low noise AC-DC Converters for medical applications. 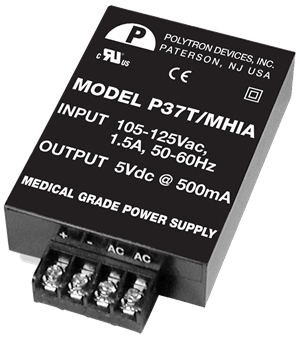 The P3/P5/MHIA Medical AC/DC linearpower supply series from Polytron Devices is UL 60601-1 Third Edition recognised. The 2MOPP compliant linear encapsulated AC-DC power module is suitable for applications including surgical equipment, patient monitoring, imaging, laboratory and diagnostics equipment. These single, dual and triple output power supplies provide 4000 Vac reinforced insulation and are available with either a PC mount or chassis mount footprint with screw terminal connections,. The P3/P5/MHIA Medical AC/DC linear series delivers an extremely low output noise of 1.0mV rms while providing a 2μA patient leakage current and a regulation line and load of 0.02 to 0.2%. In addition, these models feature short circuit protection, CE certification and optional international input voltages including dual and switchable. Gresham Power now offers industrial, medical, CompactPCI, rail and transportation, test and laboratory power solutions from world class manufacturers including Polytron Devices, EOS Power, Magna-Power, Advice Electronics and Digital Power. The range include market leading and cost competitive open frame power supplies, modular configurable and encapsulated power supplies, programmable power supplies and electronic loads and DC:DC converters.